An Elevation Certificate (EC) contains a wealth of information regarding a property and its risk of being flooded. The EC is the form provided by the Federal Emergency Management Agency (FEMA) to determine the risk of flooding. The EC consists of six pages. Pages one through four are informational regarding the property, the Flood Insurance Rate Map (FIRM), and data pertaining to the structure. Pages five and six are photos of the property and structure. So that it is easily digestible, let’s look at the first half in more depth. Please refer to the attached image for supporting information. This section provides pertinent data including: the address of the property, the property description (otherwise known as the legal description), the latitude/longitude of the property and information regarding the type of structure that is on the property such as: basement, crawl space, on slab, etc. and information regarding buildings with attached garages. This section provides pertinent data regarding the FIRM. It identifies which community, county and state the property is located in. It provides the FIRM number (as assigned by FEMA) along with the original map date, the revised map date, flood zone and the base flood elevation (BFE). 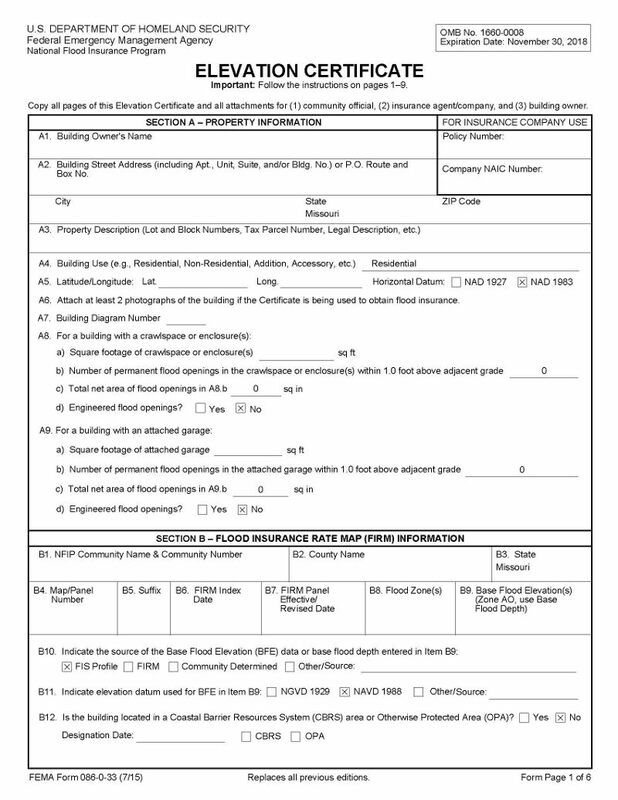 The base flood elevation is the MOST IMPORTANT number in this section, and is what I like to call our “magic number” (see box B9 in the document). This is the number that determines where the “above” or “below” happens. If the structure is above the magic number then we are above the flood plain and may not be required to carry flood insurance. This section provides the space for the Professional Land Surveyor or Engineer to report their results. The numbers listed in this section are compared to the “magic number” to see if they are above or below the BFE (see box B9). FEMA is mainly concerned about the elevation of the lowest portion of the structure (see C2a in the document), the elevation of the ground around the structure (C2f), and the elevation of any attached objects, such as a deck (C2h). If the numbers listed in these areas are higher than the BFE listed in B9 then there’s a good chance you’re out of the risk area. Don’t lose heart if not all the numbers are higher. You may still have options! While an EC can seem overwhelming, knowing which data is most important will help you better understand the final results. Once an EC is completed, it is provided to an insurance agent, who will then be able to advise as to whether or not you will need to carry flood insurance on the structure. You can visit for more information regarding Elevation Certificates and the information they provide.